The Toronto Blue Jays are a Canadian professional baseball team based in Toronto, Ontario. The Blue Jays are a member of the East Division of Major League Baseball (MLB)'s American League (AL), and play their home games at Rogers Centre. The "Blue Jays" name originates from the bird of the same name, and blue is also the traditional colour of Toronto's other professional sports teams: the Maple Leafs (ice hockey) and the Argonauts (Canadian football). In addition, the team was originally owned by the Labatt Brewing Company, makers of the popular beer Labatt's Blue. 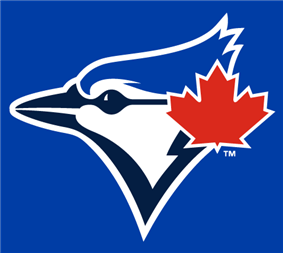 Nicknamed "the Jays", the team's official colours are royal blue, navy blue, white, and red. An expansion franchise, the club was founded in Toronto in 1977. Originally based at Exhibition Stadium, the team began playing its home games at the SkyDome, upon its opening in 1989. Since 2000, the Blue Jays have been owned by Rogers Communications, and in 2004, the SkyDome was purchased by that company, which renamed the venue Rogers Centre. They are the second MLB franchise to be based outside the United States, and currently the only team based outside the U.S., after the first Canadian franchise, the Montreal Expos, relocated to Washington, D.C. after the 2004 season and became the Washington Nationals. In the late 1970s and early 1980s, the Blue Jays went through struggles typical of an expansion team, frequently finishing in last place in its division. In 1983, the team had its first winning season, and two years later, became division champions. From 1985–1993, the Blue Jays were an AL East powerhouse, winning five division championships in nine seasons, including three consecutive from 1991–93. During that run, the team also became back-to-back World Series champions from 1992–93, led by a core group of award-winning All-Star players, including Hall of Famer Roberto Alomar, Joe Carter, John Olerud, and Devon White. The Blue Jays became the first (and to date, only) team outside the U.S. to appear in and win a World Series, and the fastest AL expansion team to do so, winning in its 16th year. Since 1993, the Blue Jays have not made the playoffs, currently the longest playoff drought in MLB, though the team has remained competitive in its division. The Blue Jays played their first game on April 7, 1977 against the Chicago White Sox before a home crowd of 44,649. 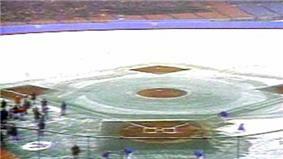 The game is now perhaps best remembered for the minor snowstorm which began just before the game started. Toronto won the snowy affair 9–5, led by Doug Ault's two home runs. That win would be one of only 54 of the 1977 season, as the Blue Jays finished last in the AL East, with a record of 54–107. After the season, assistant general manager Pat Gillick succeeded Peter Bavasi as general manager of the team, a position he would hold until 1994. In 1978, the team improved their record by five games, but remained last, with a record of 59–102. In 1979, after a 53–109 last place finish, shortstop Alfredo Griffin was named American League co-Rookie of the Year. 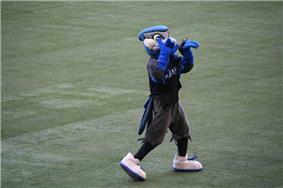 In addition, the Blue Jays' first mascot, BJ Birdy, made its debut in 1979. In 1980, Bobby Mattick became manager, succeeding Roy Hartsfield, the Blue Jays' original manager. In Mattick's first season as manager, although they remained at the bottom, Toronto almost reached the 70-win mark, finishing with a record of 67–95, a 14-win improvement on 1979. Jim Clancy led with 13 wins and John Mayberry became the first Jay to hit 30 home runs in a season. Under new manager Bobby Cox, Toronto's first solid season came in 1982 as they finished 78–84. Their pitching staff was led by starters Dave Stieb, Jim Clancy and Luis Leal, and the outfield featured a young Lloyd Moseby and Jesse Barfield. 1982 was also the Blue Jays' first season outside the bottom, as they finished sixth in the East out of seven teams. The Blue Jays' progress continued in 1984, finishing with the same 89–73 record, but this time in a distant second place behind another World Series champion, the Detroit Tigers. After 1984, Alfredo Griffin went to the Oakland Athletics, thus giving a permanent spot to young Dominican shortstop Tony Fernández, who would become a fan favorite for many years. In 1985, Toronto won its first championship of any sort: the first of their five American League East division titles. The Blue Jays featured strong pitching and a balanced offense. Tony Fernández excelled in his first full season, and veteran pitcher Doyle Alexander led the team with 17 wins, including a division-clinching complete game win. Their mid-season call up of relief pitcher Tom Henke also proved to be important. They finished 99–62 (the franchise record for most wins), two games in front of the New York Yankees. 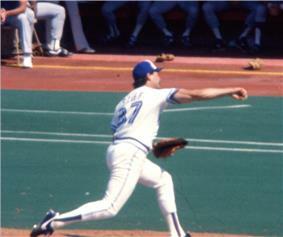 The Blue Jays faced the Kansas City Royals in the American League Championship Series (ALCS), and took a three games to one lead (known as the "Drive of '85"). However, Kansas City won three consecutive games to win the series 4–3, on the way to their first, and only, World Series championship. With Jim Clancy, Mark Eichhorn, and Jimmy Key tied for the team wins lead with 14 each. In 1987, the AVG, 47 HR, 134 RBI) was named the AL's Most Valuable Player (MVP), the only Blue Jay to be named so. In 1989, the walk-off home run, off of Chicago White Sox closer Bobby Thigpen, marked the end of the Exhibition Stadium era. The first game at the new stadium took place on June 5 against the Milwaukee Brewers; the Jays lost 5–3. In the 1989 ALCS, Rickey Henderson led the World Series champion Oakland Athletics to a 4–1 series win. In 1990, the Blue Jays again had a strong season, but finished in second place, two games behind the Boston Red Sox. Dave Stieb pitched his only no-hitter, beating the Cleveland Indians 3–0 in front of a less than capacity crowd at Cleveland Municipal Stadium. As of 2014, it remains the only no-hitter ever pitched by a Blue Jay. During the offseason, the Blue Jays made one of the two biggest trades in franchise history, sending All-Star shortstop Tony Fernández and first baseman Fred McGriff to the San Diego Padres in exchange for outfielder Joe Carter and second baseman Roberto Alomar. The Jays also obtained center fielder Devon White from the California Angels. These deals, particularly the trade with San Diego, were instrumental in the team's future success. After the 1991 season had ended, the Blue Jays acquired pitcher Jack Morris, who had led the Minnesota Twins to victory in the World Series by pitching a 10-inning complete game shutout in Game 7 and had been named the World Series MVP. To add veteran leadership to their explosive offense, Toronto signed Dave Winfield to be the team's designated hitter. The 1992 regular season went well, as the Jays clinched their second straight AL East crown with a final record of 96–66, four games ahead of the Milwaukee Brewers. They also went the entire season without being swept in any series, becoming the first team in 49 years to accomplish the feat. The Blue Jays met the Oakland Athletics (who had the same record as the Jays and led the division by six games over the defending champion Twins) in the ALCS, winning four games to two. The pivotal game of the series was Game 4, considered by many to be one of the most important games in Blue Jays history: the Blue Jays rallied back from a 6–1 deficit after seven innings, capped off by Roberto Alomar's huge game-tying two-run homer off A's closer Dennis Eckersley in the top of the ninth. This paved the way for a 7–6 victory in 11 innings, a 3-games-to-1 lead in the series and an eventual 4–2 ALCS series win. The Blue Jays then faced the Atlanta Braves in the World Series. The Braves returned after being beaten by the Twins the previous year. The pivotal game in this series turned out to be Game 2, in which reserve player Ed Sprague hit a 9th-inning two-run home run off Braves closer Jeff Reardon to give the Blue Jays a 5–4 lead, which would hold up. After winning Game 3 thanks to Candy Maldonado's ninth inning RBI hit and Game 4 due to Jimmy Key's superb 7⅓ inning pitching effort in which he retired 15 straight batters (five innings), the Jays could not win the Series on home turf as the Braves struck back with a 7–2 win in Game 5. Game 6 in Atlanta, with the Blue Jays leading 3 games to 2, was a very close game. Toronto was one strike away from winning in the bottom of the 9th inning, 2–1, but Otis Nixon singled in the tying run off the Blue Jays' closer Tom Henke. It was the first run the Toronto bullpen had given up in the series. The game was decided in the 11th inning, when Dave Winfield doubled down the left-field line, driving in two runs. The Braves would again come within one run in the bottom of the 11th, but Jays reliever Mike Timlin fielded Otis Nixon's bunt, throwing to Joe Carter at first base for the final out. The Blue Jays became the first team based outside of the United States to win the World Series. Pat Borders, the Jays' catcher, was the unlikely player who was named MVP after hitting .450 with one home run in the World Series. Oddly, Morris was acquired in large part for his reputation as a clutch postseason pitcher, but he went 0–3 in the playoffs. Morris, however, pitched well in the regular season, becoming the Blue Jays' first 20-game winner, with a record of 21–6 and an ERA of 4.04. A swing, and a belt! Left field! Way back! Blue Jays win it! The Blue Jays are World Series champions as Joe Carter hits a three-run home run in the ninth inning and the Blue Jays have repeated as World Series champions! Touch 'em all, Joe, you'll never hit a bigger home run in your life! Molitor was named the World Series MVP after hitting .500 in the series. In the regular season, three Blue Jays—Olerud, Molitor and Alomar—finished 1–2–3 for the AL batting crown, led by Olerud's franchise record .363 average. It was the first time in 100 years that the top three hitters in the league were from the same team. Expectations were high for the Blue Jays for the 1994 season, following back-to-back championships, but they slumped to a 55–60 record and a third place finish (16 games back of the New York Yankees) before the players' strike. It was their first losing season since 1982. Joe Carter, Paul Molitor and John Olerud enjoyed good years at the plate, but the pitching fell off. Juan Guzmán slumped considerably from his first three years (40–11, 3.28 ERA), finishing 1994 at 12–11 with a 5.68 ERA. Three young players, Alex Gonzalez, Carlos Delgado and Shawn Green, did show much promise for the future. At the time of the strike, their fellow Canadian cousins, the Montreal Expos had the best record in the majors, leading some to consider the possibility of a Canadian three-peat in 1994. Labatt Breweries was bought by Belgian-based brewer Interbrew (which, in 2004, merged with AmBev to become InBev), making the Blue Jays the second baseball team owned by interests outside of North America, after the Blue Jays' expansion cousins, the Seattle Mariners (by Nintendo of America). 1996 was another mediocre year for the Blue Jays, despite Pat Hentgen's Cy Young Award (20–10, 3.22 ERA). Ed Sprague had a career year, hitting 36 home runs and driving in 101 runs. However, the team's 74 wins did put them in 4th place, improving over a last place finish in 1995. The Blue Jays started 1997 with high hopes. Not only did the Jays drastically change their uniforms, they signed former Boston Red Sox ace Roger Clemens to a $24,750,000 contract. Clemens had one of the best pitching seasons ever as he won the pitcher's Triple Crown, leading the American League with a record of 21–7, a 2.05 ERA, and 292 strikeouts. This was not enough to lead the Blue Jays to the postseason, however, as they finished in last place for the second time in three years with a record of 76–86. Cito Gaston, the longtime manager who led the team to four division titles and two World Series crowns, was fired five games before the end of the season. The season did provide a unique experience for its fans with the advent of Interleague play, when the Blue Jays faced their Canadian rival, the Montreal Expos, for the first official games between the two teams. Before the start of the 1998 season, the Blue Jays acquired closer Randy Myers and slugger Jose Canseco. Gaston was replaced with former Blue Jay Tim Johnson, a relative unknown as a manager. Despite mediocre hitting, strong pitching led by Clemens' second straight pitching Triple Crown (20–6, 2.65 ERA, 271 strikeouts) sparked the Blue Jays to an 88–74 record – their first winning season since 1993. However, this was only good enough to finish a distant third, 26 games behind the New York Yankees, who posted one of the greatest records in all of baseball history at 114–48. They were, however, in contention for the wildcard spot until the final week. Before the 1999 season, the Blue Jays traded Clemens to the Yankees for starting pitcher David Wells, second baseman Homer Bush and relief pitcher Graeme Lloyd. They also fired manager Tim Johnson during spring training after he lied about several things (including killing people in the Vietnam War) in order to motivate his players. The Blue Jays had initially been willing to stand by Johnson. A blizzard of questions about his credibility during spring training, however, led Ash to fire him less than a month before opening day. Johnson was replaced with Jim Fregosi, who managed the Phillies when they lost to the Blue Jays in the 1993 World Series. The offense picked up somewhat in 1999, but the pitching suffered without Clemens, as the Blue Jays finished at 84–78, in third place. After the 1999 season, the Blue Jays' original mascot for 20 years, BJ Birdy, was replaced by a duo named Ace and Diamond. On September 1, 2000, Rogers Communications Inc. purchased 80% of the baseball club for $160 million, with Interbrew (now InBev) maintaining 20% interest and the Canadian Imperial Bank of Commerce relinquishing its 10% share. Rogers eventually acquired the 20% owned by Interbrew and now has full ownership of the team. The 2001 season marked the 25th anniversary of the franchise's inception. Buck Martinez, a former catcher and broadcast announcer for the Blue Jays, took over as manager before the season began. The Blue Jays had a disappointing season, as the team fell back under .500, finishing at 80–82, with mediocre pitching and hitting. Delgado led the team again with 39 home runs and 102 RBI. After the 2001 season ended, the Blue Jays fired Gord Ash, ending a seven-year tenure as general manager. J. P. Ricciardi, then director of player development under Oakland Athletics general manager Billy Beane, was named the Blue Jays' General Manager and was expected to slash the payroll immediately, in order to stem the tide of red ink. During the off-season, the team traded or let go several popular players, including Alex Gonzalez, Paul Quantrill, Brad Fullmer and closer Billy Koch to let talented youngsters such as Eric Hinske and Felipe Lopez get a chance to develop into major leaguers. The Blue Jays started the 2002 season with slow progress in performance. Buck Martinez was fired about a third of the way through the season, with a 20–33 record. He was replaced by third base coach Carlos Tosca, an experienced minor league manager. They went 58–51 under Tosca to finish the season 78–84. Roy Halladay was relied on as the team's ace and rose to the challenge of being the team's top pitcher, finishing the season with a 19–7 record and 2.93 ERA. The hitters were led once again by Carlos Delgado. Promising young players were assigned to key roles; starting third baseman Eric Hinske won the Rookie of the Year Award at the season's conclusion, and 23-year-old center fielder Vernon Wells had his first 100 RBI season. The 2003 season was a surprise to both team management and baseball analysts. After a poor April, the team had its most successful month ever in May. Carlos Delgado led the majors in RBI, followed closely by Wells. Despite their hitting successes, poor pitching continued to plague the team. Halladay was an exception, winning his first Cy Young Award, going 22–7, with a 3.25 ERA. In July, Shannon Stewart was traded to the Minnesota Twins for Bobby Kielty, another outfielder with a much lower batting average than Stewart's. Although the Jays finished in third place in their division, Delgado was second in the voting for the American League MVP Award. In the off-season, Kielty was traded to the Oakland Athletics for starter Ted Lilly. The 2004 season was a disappointing year for the Blue Jays right from the beginning. They started the season 0–8 at SkyDome and never started a lengthy winning streak. Much of that was due to injuries to All-Stars Carlos Delgado, Vernon Wells and Roy Halladay among others. Although the additions of starting pitchers Ted Lilly and Miguel Batista and reliever Justin Speier were relatively successful, veteran Pat Hentgen faltered throughout the season and retired on July 24. Rookies and minor league callups David Bush, Jason Frasor, Josh Towers and others filled the void in the rotation and the bullpen; however, inconsistent performances were evident. With the team struggling in last place and mired in a five-game losing streak, manager Carlos Tosca was fired on August 8, 2004, and was replaced by first base coach John Gibbons. Long-time first baseman Carlos Delgado became a free agent in the off-season. Nevertheless, prospects Russ Adams, Gabe Gross, and Alex Ríos provided excitement for the fans. Rookie pitchers David Bush, Gustavo Chacín and Jason Frasor also showed promise for the club's future. The Blue Jays' lone MLB All-Star Game representative was Lilly. After the 2004 season, FieldTurf replaced AstroTurf as the Rogers Centre's playing surface. SkyDome was renamed Rogers Centre. The Blue Jays had a good start to the 2005 season. They led the AL East from early to mid-April and held their record around .500 until late August. The Jays were hit with the injury bug when third baseman Corey Koskie broke his finger, taking him out of the lineup, but the club was pleasantly surprised with the performance of rookie call-up Aaron Hill in his stead. On July 8, just prior to the All-Star break, Blue Jays ace Roy Halladay was struck on the shin by a line drive, resulting in a fractured leg. Though Halladay's injury was hoped to be minor, the recovery process was met with constant delays, and eventually, he was out for the rest of the season. Prior to his injury, the Blue Jays were in serious wild card contention, but soon fell out of the playoff race. The team received glimpses of the future from September call-ups Guillermo Quiróz, John-Ford Griffin, and Shaun Marcum. Marcum made himself noteworthy by posting an ERA of 0.00 over five relief appearances and eight innings in September. Josh Towers also stepped up, showing largely unseen potential by going 7–5 with a 2.91 ERA in the second half of the season. 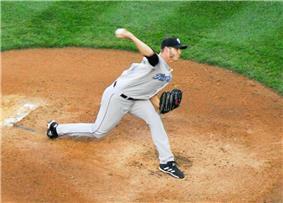 The Blue Jays' 2008 season featured a strong pitching staff, which led the major leagues with a 3.49 ERA. For much of the season, however, the team struggled to hit home runs and drive in runs. On May 24, starter Jesse Litsch set a team record, with 38 consecutive innings without giving up a walk. On June 20, following a five-game losing streak and with the Jays in last place in the AL East, management fired John Gibbons and several members of his coaching staff, and re-hired Cito Gaston. Meanwhile, Alex Ríos had 32 stolen bases, making him the first Blue Jay with 30 since 2001. On September 5, Roy Halladay earned his 129th career win, moving him into second spot on Toronto's all-time wins list. 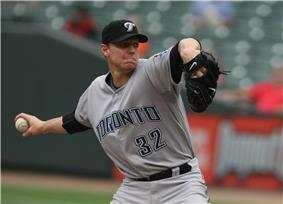 Halladay also came second in the voting for the Cy Young Award, after posting a 20–11 record and 2.78 ERA. The 2009 season saw the addition of two new patches on the Blue Jays' uniforms: on the right arm, a bright red maple leaf (part of the Canadian flag), and on the left arm, a small black band with "TED" written on it, in reference to the late team owner Ted Rogers, who died in the off-season. 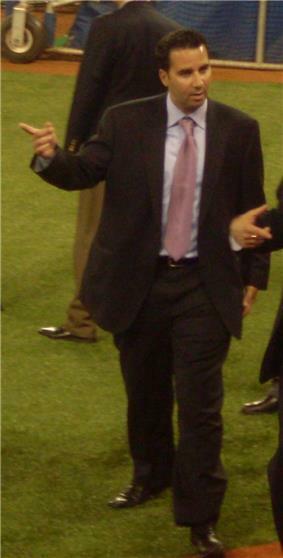 2010 was Alex Anthopoulos' first full season as General Manager of the Jays. In the off-season, the Jays' ace Roy Halladay was traded to the Philadelphia Phillies for Kyle Drabek, Travis d'Arnaud, and Michael Taylor; Taylor was immediately traded to the Oakland Athletics for Brett Wallace. The team's significant free agent signings were that of catcher John Buck and shortstop Álex González. The 2010 season was a surprising 10-win improvement over the last season. It was a career year for 50 home runs and the first since Alex Rodriguez and Prince Fielder achieved the feat in 2007. The Blue Jays also set a franchise record for the most home runs in a single season as they hit 257, 13 more than their previous record of 244 set by the 2000 Blue Jays. The Blue Jays tied the 1996 Baltimore Orioles for the third most home runs by a team in a single season. Seven players (José Bautista, Vernon Wells, Aaron Hill, Adam Lind, Lyle Overbay, John Buck, and Edwin Encarnación) hit 20 home runs or more throughout the season, tying an MLB record previously set by four teams, including the 2000 Blue Jays. Led by new manager John Farrell, the Blue Jays' 2011 season was up-and-down for the most part, as the team finished with a .500 record. After signing a five-year $64 million contract extension, José Bautista followed up his record-setting 2010 season with an arguably better season. He finished with a Major League-leading 43 home runs, along with 103 RBI, 132 walks, and a .302 average. Rookie J. P. Arencibia also had a successful year, setting a Blue Jays single-season record with 23 home runs by a catcher. In August, third base prospect Brett Lawrie made his Major League debut and hit .293 with 9 home runs, 4 triples, and 25 RBI, in just 43 games. On July 31, the Blue Jays retired their first number, Roberto Alomar's #12, one week after Alomar became the first Hall of Famer to be inducted as a Blue Jay. The 2012 season was an injury-plagued year for the Blue Jays, having used 31 total pitchers, which set a franchise record. In June, three starting pitchers (Brandon Morrow, Kyle Drabek, and Drew Hutchison) were lost to injury in a span of four days, two of whom required Tommy John surgery; in addition, starters Dustin McGowan and Jesse Litsch missed the entire season due to injury. In the second half of the season, some key players in Toronto's lineup, including All-Star José Bautista, missed a significant amount of playing time due to injury, sending the team into a freefall and culminating in a 73–89 record. Despite the underachievements of Ricky Romero and Adam Lind, Casey Janssen established himself as a reliable closer (22 SV, 2.52 ERA) and Edwin Encarnación developed into one of the league's best power hitters (.280 AVG, 42 HR, 110 RBI). During the offseason, the Toronto Blue Jays traded Farrell to the Boston Red Sox per his wishes, and former manager John Gibbons returned to manage the Blue Jays. The Jays also made a blockbuster trade with the Miami Marlins, leading to a series of other blockbuster trades and signings, including with the New York Mets for National League Cy Young winner R.A. Dickey and free agents including Melky Cabrera. On June 8, the Blue Jays played the then-longest game in franchise history by innings, winning 4–3 in 18 innings against the visiting Texas Rangers, which would be broken one season later. The Jays matched their franchise record of 11 consecutive wins in a 13–5 home win over the Baltimore Orioles on June 23. However, the Jays had a losing season overall. Pitcher Roy Halladay signed a one-day contract with the Blue Jays before retiring from baseball, citing injuries. The Jays had a nine-game win streak from May 20 to 28, as well as wins in 18 of 21 between May 15 and June 6. On August 10, the Blue Jays played the longest game in franchise history by both time and innings, winning 6–5 in 19 innings and 6 hours, 37 minutes against the visiting Detroit Tigers. During the off-season, the Jays signed Toronto-born catcher Russell Martin to a five-year $82 million contract. On November 28, 2014, the Jays acquired All-Star third baseman Josh Donaldson from the Oakland Athletics in exchange for Brett Lawrie, Kendall Graveman, Sean Nolin, and Franklin Barreto. from regional sports networks and related businesses in the total value. In 1977, after only 50 home games, the Blue Jays set an MLB record for a first-year expansion team, with an overall attendance of 1,219,551. By the end of the season, 1,701,152 fans had attended. In 1991, the Blue Jays became the first MLB team to attract over four million fans, with an attendance of 4,001,526, followed by 4,028,318 in 1992. Each of those records were broken in 1993 by the expansion Colorado Rockies, although the Blue Jays' 1993 attendance of 4,057,947 stood as an AL record for 12 years until it was broken by the 2005 New York Yankees. Several Blue Jays became popular in Toronto and across the major leagues, starting with Dave Stieb, whose seven All-Star selections is a franchise record. He is closely followed by Roy Halladay, who was selected six times, and by Roberto Alomar, Joe Carter, and José Bautista, who were selected five times each. Bautista set a major league record in 2011 (which stood for only one year), with 7,454,753 All-Star votes. During the seventh-inning stretch of home games, before singing "Take Me Out to the Ball Game", Blue Jay fans sing and clap to "OK Blue Jays" by Keith Hampshire and The Bat Boys, which was released in 1983. The song was remixed in 2003, and since then, the new shortened version is played at home games. From 1979 to 1999, BJ Birdy served as the Blue Jays' mascot, played by Kevin Shanahan. In 2000, he was replaced by a duo named Ace and Diamond. After the 2004 season, Diamond retired, leaving Ace as the team's sole mascot. The Detroit Tigers are the Blue Jays' geographic and traditional rival, dating back to the 1980s, when the teams were AL East contenders. The Tigers moved to the AL Central in 1998, and the rivalry has died down as a result, with the teams facing each other only six times per year since 2011. The Montreal Expos were the Blue Jays' geographic National League rival, being the other Canadian MLB team before it was relocated. From 1978 to 1986, the teams played an annual mid-season exhibition game, known as the Pearson Cup. The teams began facing each other in the regular season in 1997, with the advent of interleague play. During the 2003 and 2004 seasons, the Expos' last two seasons before relocating to Washington, D.C., the Pearson Cup was awarded after a pair of three-game sets. The Blue Jays' former radio play-by-play announcer, Tom Cheek, called every Blue Jays game from the team's inaugural contest on April 7, 1977 until June 3, 2004, when he took two games off following the death of his father — a streak of 4,306 consecutive regular season games and 41 postseason games. Cheek died in 2005 and the team commemorated him during their 2006 season by wearing a circular badge on the left sleeve of their jerseys. The badge was adorned with Cheek's initials, as well as a stylized microphone. Cheek is also honoured with a place in the Blue Jays' "Level of Excellence" in the upper level of the Rogers Centre; the number 4,306 is depicted beside his name. In 2008, Cheek received the third highest amount of votes by fans to be nominated for the Ford C. Frick Award for broadcasting excellence. Cheek finally received the Frick Award posthumously in 2013. Radio broadcasts of Blue Jays games are originated from Sportsnet 590 CJCL in Toronto, which like the Blue Jays is owned by Rogers Communications. Jerry Howarth is the lead play-by-play announcer, with Mike Wilner as the secondary play-by-play announcer. During the 2007 to 2012 seasons, Alan Ashby was the colour commentator. Former Blue Jays pitcher Jack Morris served as the colour commentator during the 2013 season, when he was replaced by former catcher Joe Siddall. Former Blue Jays pitcher Dirk Hayhurst filled in for Morris for some games during the 2013 season. Another former catcher for the Blue Jays, Gregg Zaun, has served as the occasional colour commentator since the 2011 season. Former catcher Joe Siddall took over the colour commentator role for the 2014 season. The Toronto Blue Jays have the largest geographical home market in all of baseball, encompassing all of Canada. Despite this, the number of radio stations that broadcast games is actually quite small. Only twenty radio stations across the country aired at least some Blue Jays games during the 2011 season, which is fewer affiliates than most teams. All Blue Jays games are carried nationally on Sportsnet (which, like the Blue Jays, is owned by Rogers Communications), with Buck Martinez as the play-by-play announcer, and Pat Tabler as the primary colour analyst. Jack Morris joined Martinez and Tabler on air for one series. In previous years, the colour analyst role rotated between Pat Tabler, Rance Mulliniks, Darrin Fletcher, and since the 2011 season, Gregg Zaun. Sportsnet became the team's primary carrier soon after it launched in the late 1990s, and became the team's exclusive broadcaster in 2010. As of August 2010, Sportsnet One also broadcasts Blue Jays games (often in case of scheduling conflicts with the main Sportsnet channels). Rogers was however, criticized by fans and critics due to Sportsnet One only being carried by Rogers Cable systems on launch. Since all of Canada is considered the Blue Jays' home territory, it is not possible for Canadian fans to watch live Blue Jays games on MLB.tv. In September 2012,  On June 27, 2013, Rogers' Toronto multicultural station Omni.2 simulcast a Blue Jays game (where Taiwanese player Chien-Ming Wang was scheduled to start) with commentary in the Mandarin Chinese language, marking the first ever Canadian MLB broadcast in the language. The Sports Network (TSN), which (like the Jays) was owned by Labatt from 1984 to 1995, served as the primary cable television outlet for the Blue Jays prior to the launch of Sportsnet. TSN (and later, its sister channel TSN2) continued to carry approximately ten Jays games through the 2009 season until May 2010; most recently, Rod Black handled play-by-play while Tabler served as colour commentator on these telecasts. CBC has carried Blue Jays games intermittently throughout the team's history, most recently in 2007 and 2008; those broadcasts featured Jim Hughson as the play-by-play announcer, and former Blue Jays Rance Mulliniks and Jesse Barfield on colour commentary. Games also aired on CTV (except in Montreal) from the team's inception until the late 1990s. The Blue Jays have not appeared over-the-air in Canada since 2008. Six former Blue Jays, one former manager, and one former general manager, have been elected into the Baseball Hall of Fame. Second baseman Roberto Alomar, elected to the Hall of Fame in 2011, is the first player to be inducted based primarily on service as a Blue Jay. Roberto Alomar's retired number 12 hangs above the Rogers Centre videoboard. Jackie Robinson's number was retired by every team in MLB on April 15, 1997. Soon after being the first person to be inducted in the Hall of Fame as a Blue Jay, on July 31, 2011, second baseman Roberto Alomar was the first person to have his number retired by the Blue Jays. Players' uniform numbers were listed — and in Tom Cheek's case, the number of consecutive games he called for the Blue Jays — until the 2013 All-Star Break even though, with the exception of Roberto Alomar's, these numbers have not been retired. During the 2013 All-Star Break, the Level of Excellence was redesigned for the addition of Carlos Delgado's name. The redesign removed all uniform numbers from the Level of Excellence aside from Roberto Alomar's retired #12 and Tom Cheek's 4306 for his consecutive games called streak. ^ Gregor Chisholm (November 18, 2011). "Blue Jays unveil new logo for 2012 season". BlueJays.com. Retrieved November 18, 2011. ^ Braun, Wayne; Brehl, Jack (1985). The Drive of '85: A Salute to the Blue Jays by the Toronto Star. Doubleday Canada. ^ 1943 St. Louis Cardinals Baseball-Reference.com. Accessed on June 13, 2014. ^ "October 24, 1992 World Series Game 6 at Atlanta-Fulton County Stadium Play by Play and Box Score". Baseball-Reference.com. October 24, 1992. Retrieved February 19, 2011. ^ "Ted Rogers buys The Blue Jays". ^ Bastian, Jordan (July 2, 2006). "Five Jays named to AL All-Star squad". MLB.com. Retrieved June 18, 2007. ^ Bastian, Jordan (October 3, 2009). "Ricciardi out as Blue Jays GM". ^ By Jordan Bastian / MLB.com. "Blue Jays ink shortstop Gonzalez | bluejays.com: News". Toronto.bluejays.mlb.com. Retrieved February 19, 2011. 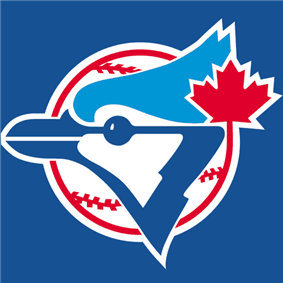 ^ "Spring preview: Rotation key for Blue Jays". USA Today. January 25, 2011. Retrieved March 12, 2012. ^ "Blue Jays acquire Francisco in exchange for Napoli". Tsn.ca. January 25, 2011. Retrieved February 19, 2011. ^ a b "A season to forget in Blue Jay land". ^ "Blue Jays outlast Indians in 16-inning marathon opener". ^ Kennedy, Brendan (June 8, 2013). "Toronto Blue Jays win longest game in 18 innings". TheStar.com. Retrieved June 8, 2013. ^ Chisholm, Gregor (June 23, 2013). "Blowout win puts Blue Jays firmly in AL East race". MLB.com. Retrieved June 23, 2013. ^ "Detroit Tigers at Toronto Blue Jays - August 10, 2014". MLB.com. Retrieved August 10, 2014. ^ Chisholm, Gregor (November 28, 2014). "Donaldson reeled in from A's for Lawrie, prospects". MLB.com. Retrieved November 28, 2014. Baldo, Anthony; Biesada, Alexandra; Hackney, Holt; Ozanian, Michael K; Taub, Stephen (1991-07-09). "Secrets of the front office: What America's pro teams are worth". Ozanian, Michael K; Taub, Stephen; Morris, Kathleen; Fink, Ronald (1992-07-07). "Big leagues, bad business". Ozanian, Michael K; Taub, Stephen; Fink, Ronald; Kimelman, John; Reingold, Jennifer; Starr, Jason (1993-05-25). "Foul ball". Ozanian, Michael K; Fink, Ronald; Kimelman, John; Reingold, Jennifer; Osterland, Andrew; Starr, Brooke; Grabarek (1994-05-10). "The $11 billion pastime: Why sports franchise values are soaring even as team profits fall". Ozanian, Michael K; Atre, Tushar; Fink, Ronald; Reingold, Jennifer (1995-05-09). "Suite deals: Why new stadiums are shaking up the pecking order of sports franchises". Atre, Tushar; Auns, Kristine; Badenhausen, Kurt; McAuliffe, Kevin (1996-05-20). "The high-stakes game of team ownership". Badenhausen, Kurt; Nikolov, Christopher (1997-06-17). "More than a game: An in-depth look at the raging bull market in sports franchises". ^ "#20 Toronto Blue Jays". ^ a b "Major League Baseball Franchise Valuations". ^ "Yankees reach four million in tickets sales for second consecutive season". MLB.com. July 2, 2006. Retrieved December 13, 2011. ^ "Grand slam: Jose Bautista nabs a record number of All-Star votes". Toronto Star. July 3, 2011. Retrieved December 7, 2011. ^ Fordin, Spencer. "Cheek's wife accepts Frick Award with moving speech". MLB Advanced Media. Retrieved August 22, 2013. ^ "Blue Jays Radio Network | bluejays.com: Schedule". Toronto.bluejays.mlb.com. March 22, 2010. Retrieved February 19, 2011. ^ By Jordan Bastian / MLB.com (January 17, 2006). "Martinez joins Jays as play-by-play man | bluejays.com: News". Toronto.bluejays.mlb.com. Retrieved February 19, 2011. ^ Dowbiggun, Bruce. "Pelley will need all his smarts to fix Sportsnet One fiasco". Globe and Mail (Canada). Retrieved August 23, 2010. ^ "Three Blue Jays games to feature described video". bluejays.com. MLB Advanced Media. Retrieved 8 June 2013. ^ "OMNI to air Blue Jays vs Red Sox in Mandarin, Thursday". Citynews.ca. Rogers Media. Retrieved 28 June 2013. ^ "OMNI TV To Air First Mandarin Broadcast of MLB Game in Canada". Broadcaster Magazine. Retrieved 28 June 2013. ^ "Mulliniks, Barfield join CBC's Blue Jays booth". Canada: CBC. June 7, 2007. Retrieved June 18, 2007. ^ Harrington, Mike (17 September 2012). "Herd signs with Blue Jays for two years". ^ Carr, Samantha (December 6, 2010). "Emotional Election". National Baseball Hall of Fame and Museum. Retrieved January 5, 2011. ^ "Roberto Alomar's uniform number to be retired by Blue Jays | MLB.com: News". Mlb.mlb.com. Retrieved November 19, 2011. ^ "Level of Excellence". Toronto Blue Jays. Retrieved November 19, 2011. ^ McNeil, Shane (July 20, 2011). "YOUR CALL: SHOULD THE BLUE JAYS RETIRE ANY MORE NUMBERS?". TSN. Retrieved November 19, 2011.